How can I make a custom plugin for Charts? details Background: What is the PDB (Protein Data Bank) file format? View the plugin in action, rotate the molecule and change its style. Under which license is this plugin distributed? Can you find the minified code file of this plugin? In this section we will download the viewer and add it to a local Galaxy instance. All development takes place within the Galaxy codebase. The first thing we are going to do is to clone a Galaxy instance and prepare the directory structure for the new visualization plugin. Logo (logo.png) which will appear in Chart’s plugin selection interface. Configuration (config.js) describing input parameters and options. Wrapper (wrapper.js) which serves as a bridge between Galaxy and our 3rd-party plugin. In the following sections we are going to discuss these files in more detail, create and place them into our plugin directory at myviz/pdb. Let’s start with the logo for our visualization. Each visualization is represented by a logo in the Charts interface. This makes it easier for users to find and configure their visualization. The logo should be in the png-file format. It will appear with a width of 120 pixels. Find an arbitrary image in PNG-file format. Possibly using Google’s image search. Copy it to the myviz/pdb directory and name it logo.png. Each visualization has a configuration file named config.js. This file has conceptual similarities with a Tool’s XML-file. It allows developers to specify a variety of attributes and input parameters for their visualization. Throughout this tutorial we are going to gradually augment this file but for now we keep it simple. Place it into your plugins directory at myviz/pdb. This configures the plugin’s name and a description which will appear on the Charts selection interface. It also links the plugin to the PDB-file format, which means that for any history item of these file type the plugin will automatically become available. Keywords are optional and can help to improve the annotation. charts: The model of the current visualization with attributes, settings etc. // Add code to configure and execute the plugin here. The above wrapper does not do much yet, except requesting the minified plugin code which we downloaded earlier. In order to execute a 3rd-party plugin we need to figure out how it works. This can be done by finding a working example or documentation. Fortunately the PV-Viewer comes with both. Let’s take a look at the documentation. Identify the parameter which is needed to initialize the plugin when calling pv.Viewer(). Which of the wrapper option components represents this parameter? Can you identify which mode settings are valid to render the structure with pv.Viewer.renderAs()? Now that we have learned the basics on how the viewer plugin works, we can initialize and load it in wrapper.js. Now that we have completed the Charts plugin definition, it is time to bundle the scripts and libraries into a single module file using webpack. Once packed the plugin will be accessible through Galaxy’s user interface. Packing modules does not require restarting your Galaxy instance, just make sure to properly refresh your browser. 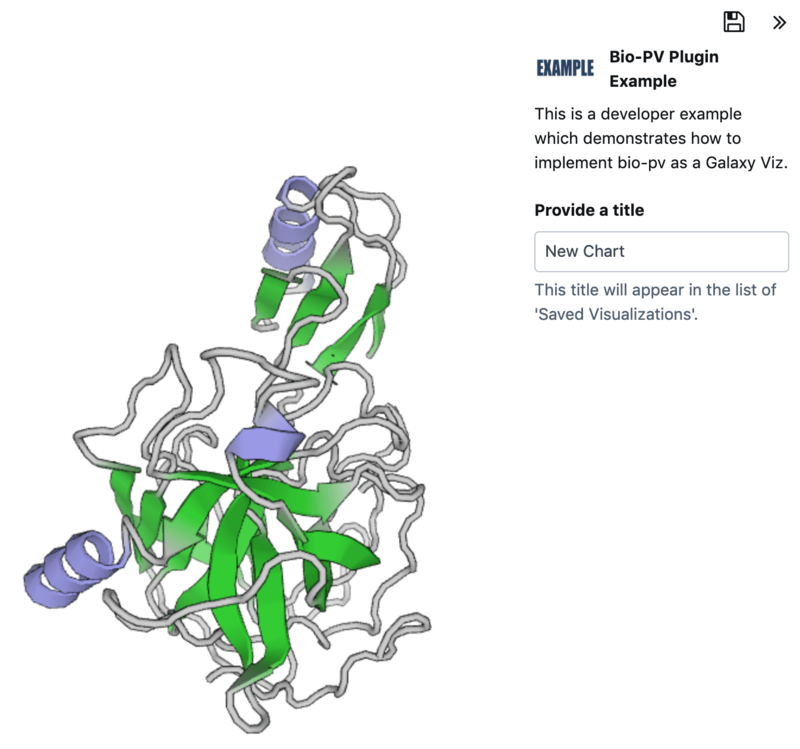 In this section we will select a PDB-file from the Protein Databank and visualize it with our new plugin. Copy the link to the raw PDB-file e.g. Open the uploader dialog, paste the above link and click on Start. Close the upload dialog, and select the file from the history panel on the right. Find your visualization and double-click on its logo. Load Charts and test different rendering modes in the Customization tab of your visualization. Load Charts and test new options in the Customization tab of your visualization. First of all, thank you for completing this tutorial. We have learned how to add visualizations to the Charts framework and how to build a custom visualization form. This material is the result of a collaborative work. Thanks to the Galaxy Training Network and all the contributors ( Saskia Hiltemann, Youri Hoogstrate, Björn Grüning, Aysam Guerler)!